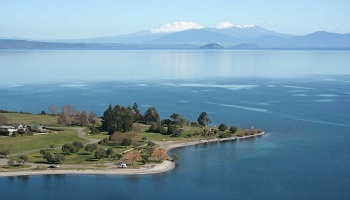 Lake Taupo was created from a major volcanic eruption. Hot springs appear in several places around the Lake, which is now an extinct volcanic crater. As well as this a number of hot pool complexes have been developed for visitors to take advantage of the natural hot water. Just north of Taupo, near the Wairakei International Golf Course, underground steam has been harnessed for electricity generation. 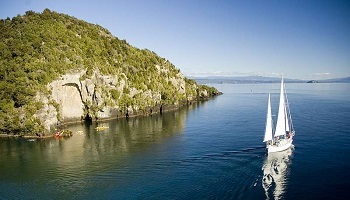 Lake Taupo is also one of the North Island's most popular holiday destinations, both in summer and in winter. The town centre is crammed with cafes and interesting shops and the Huka Falls area is great for picnics and nature walks. 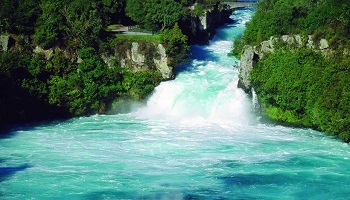 The only outlet from Lake Taupo is the mighty Waikato River, New Zealand's longest river, which gushes through a narrow chasm at Huka Falls.